We don’t eat a lot of cake in the Haggerty household. It’s just the two of us, and we don’t particularly eat a lot of anything, especially sweets. Which is too bad, because I love to bake and can be quite good at it. So when I DO decide that a cake is forthcoming, it needs to be out of this world. This cake, alas, was not that memorable. I found myself with zucchini remaining in the fridge last week, despite the fact that the CSA ended a few weeks ago. (I actually found more zucchini in the fridge yesterday. I fear it has become sentient and is reproducing at will.) I decided to end the season with a bang after I found a recipe for Zucchini Cake With Chocolate Cream Cheese Frosting at Seriouseats.com. 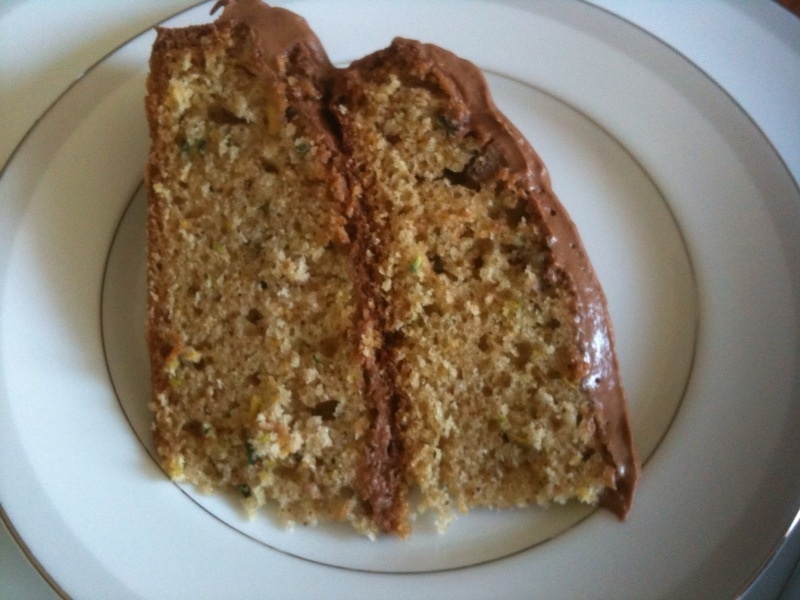 The recipe promised me a “triple-threat of complementary flavors,” including zucchini, chocolate and cream cheese. It was … OK. The cake itself was kind of dry, and the chocolate frosting couldn’t make up for it no matter how rich it was. I would have been better off making plain old zucchini bread and wrapping it for the freezer while I made a more fabulous cake. The cream cheese frosting is pretty delicious by itself, however. After I took the photo above I scraped it off, ate it and threw the cake away. Baker’s prerogative.